On Saturday's, I make something special for breakfast, and make it substantial enough to call it brunch -- so I don't have to make lunch just a few hours later ;-) . This past weekend, we had a waffle bar. 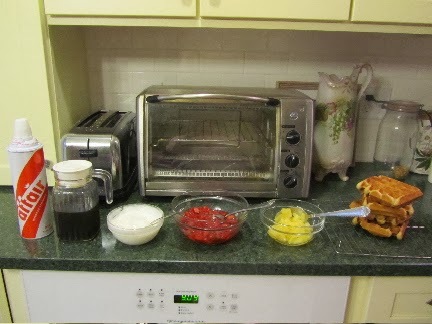 I made whole wheat waffles, and set out several toppings to choose from: canned pineapple chunks, frozen strawberries (from last summer's garden), vanilla yogurt, maple syrup and whipped cream. Other toppings that we've enjoyed include chopped nuts, dried fruit, cottage cheese, ham dices, banana slices, applesauce, fresh orange segments, shredded coconut, jam and jelly, blackberry syrup (homemade with wild-picked blackberries), frozen raspberries and blueberries (also from last summer's garden). It's one of those whatever-I-have -on-hand sort of meals. I try to include a source of protein (besides the waffles themselves), some fruit and some fun stuff. Waffle bars are always a hit with our family. I think that's due to having the opportunity to customize your own waffle. Thanks! I hope you're having a great Valentine's Day! You never cease to amaze. We have special breakfasts around here, but not every week. Once again, your family to very lucky to have you. Oh this is just my way of getting out of making lunch on Saturdays! I hate interrupting whatever I'm doing on a Saturday, to make lunch! Happy Valentine's Day! Yes, I just add some vanilla extract and sugar to the yogurt. If you've ever tried blending sugar into something think like yogurt, you'll know that it remains grainy for about 10 minutes. So, I make the vanilla yogurt before starting the waffles, and stir a few times. Then the sugar is fully incorporated by the time we put our waffles together. Of course, having honey would totally prevent that problem. Blueberry syrup sounds so wonderful. Blueberries may just be my favorite fruit -- you're very fortunate to live where they grow so well. We have a few blueberry bushes, but they're not exactly prolific. Door's always open! Hope you're having a fabulous Valentine's Day! Oh yum! that does sound good! Thanks for the suggestion!